Transit ridership in Northern Virginia fell in the year ending in June, and the data suggest that the declines at Metro led the way. WASHINGTON — Transit ridership in Northern Virginia fell in the year ending in June, particularly dragged down by a steep drop on Metro, new data suggest. Between July 1, 2016 and June 30, 2017, Metrorail service was reduced or nonexistent due to major track work at least one Virginia station for 229 days — nearly 63 percent of the year. “Overall transit ridership in Northern Virginia was down 9.0 percent between FY2016 and FY2017. This decline primarily reflected service impacts related to WMATA’s SafeTrack program,” Northern Virginia Transportation Commission documents conclude. Metrorail trips at Virginia stations dropped 11.9 percent year-over-year, though they still make up two-thirds of all transit trips in Northern Virginia. Metro has blamed track work and rider concerns about safety or delays as key reasons for the long-term ridership decline. Arlington’s ART buses and Virginia Railway Express commuter rail were the only two transit providers in the region to see significant increases in ridership over the previous fiscal year, up 9.1 percent and 7.4 percent respectively. VRE had more riders than at any point in the last five years as riders evidently looked for alternatives to Metro. ART’s ridership boost was magnified since the agency also added service. Riders took 8.4 percent fewer trips on PRTC bus routes after the agency serving the Prince William and Manassas areas cut service and raise fares last summer to address a budget shortfall. Loudoun County Transit ridership remained relatively unchanged overall, since commuter bus riders stuck with the system after a $1 fare increase, but Metro Connection service ridership dropped 8 percent. 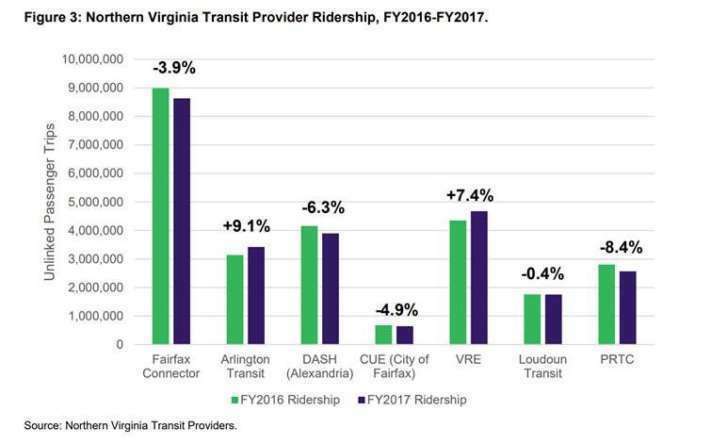 Fairfax Connector ridership declined 4.1 percent overall, with a 5.19 percent decline on an average weekday. The county-controlled transit system believes Metro track work and storm-related service disruptions played the most significant roles in the year-over-year decline. “Since nearly two-thirds of bus trips in Northern Virginia connect to Metrorail, most agencies saw declines in bus ridership that were related to declines in rail ridership. While most agencies saw ridership declines, VRE and ART saw ridership increases that were partially due to their use as alternative travel during the SafeTrack surges. While difficult to measure, there are also larger national trends at work that impact transit ridership including gas prices, teleworking, and transportation network companies (Uber, Lyft, etc. ),” commission staff wrote. In April, May and June, Northern Virginia transit ridership dropped 5.2 percent compared with the same period in 2016 as track work disruptions led to fewer people taking the bus to the train. Only VRE increased ridership, as some riders found an alternative to Metro. The rotating track work zones make year-to-year comparisons for ridership at individual Metro stations difficult, but Silver Line stations in Tysons and Reston each saw increases in year-to-year ridership over the three-month period, while ridership at Orange Line stations mostly dropped slightly. Compared to June 2016, when significant track work disrupted the Blue, Orange and Silver Lines, Metrorail ridership ticked back up 3.2 percent across Northern Virginia in June 2017. Average weekday ridership rose 2 percent over last year’s numbers. Metrobus ridership across Northern Virginia was down 6.7 percent in June. In July, Virginia rail trips rose 5.2 percent over the previous year. The weekday average rose 6 percent to 289,693 unlinked trips per day, and more people parked at each of Virginia’s Metro lots than the previous July, when track work disrupted the Blue and Yellow lines among others.